Threaded heads allow faces in nylon or brass to be replaced. One size is brass faced, the other is a nylon material. Both sides are replaceable and a fiber face is also available. For most watch repair use, most people prefer this lighter Mallet, then the heavier model below. Total weight with handle is 4.6 oz. 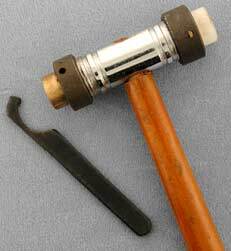 Click on link for brass, fiber, and nylon replacement face for the Brass-Nylon Mallet, 3.8 Ounce. 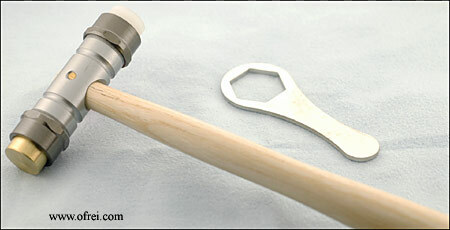 Click on link for brass, fiber, and nylon replacement face for the Brass-Nylon Mallet, 5.8 Ounce. Bergeon presents a deluxe mallet with nylon and brass faces. 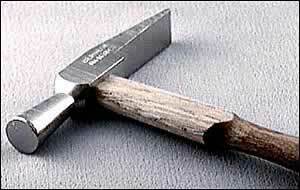 This Bergeon mallet is in a class by itself compared to it's competition, as expected with any Bergeon tool. With two face types on one mallet, the softer scratch resistant material of the nylon faces on one side and the harder brass face on the other side. Features a sleek lightweight handle for a lighter touch. Total weight with handle is 3.9 oz. As far as ratings go, this mallet stands last compare to the others we offer. Fairly inexpensive, but you get what you pay for. 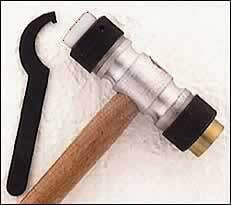 Double sided hammer with 7/8" diameter nylon head and plastic handle with rubber grip. Total length of hammer is 10 3/4"
Bergeon watchmakers hammer 1438-C3, 200 mm long wooden handle with a polished steel 70 mm head. Bergeon watchmakers hammer 1438-C2, 200 mm long wooden handle with a polished steel 60 mm head. Bergeon watchmakers hammer 1438-C1, 200 mm long wooden handle with a polished steel 50 mm head.